Physical activity plays a crucial role in the current life style for the good health. Health experts stress on doing exercises, sports or yoga for a healthy living. Let us discuss about Yoga VS Gym. Yoga has become immensely popular these days, because of the advantages it has. The people practicing exercises or gym often wonder whether to take up yoga or not. There are many differences and benefits of both of them. Physical exercises help in relieving the stress, making a person active and enhance the mood in a positive way. They even decrease the chances of disorders like high blood pressure, heart problems, diabetes, muscles pains, etc. Above all, yoga is beneficial in relieving a person from stress, anxiety, depression and other psychological disorders. So you can choose any of the physical activity for a better life. 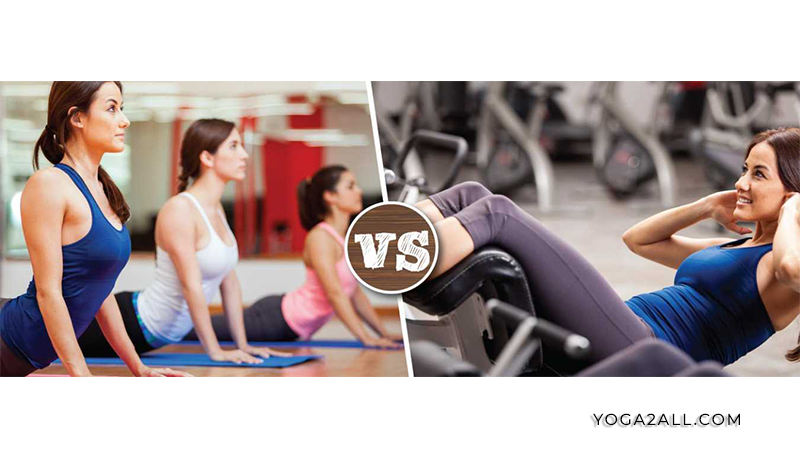 Yoga versus Gym- Which Is Better? Both of the physical activities are good in their own way, and it is difficult to testify against their pros and cons. Both of the exercises aim to make your life better for different purposes and are designed after analyzing. They both share a common purpose of making a person healthy and physically better.They have a common aim of better health and physical fitness. Gym and other physical exercises like swimming and aerobic workout put the body to a rigorous work and helps in burning some calories along with flexibility in body movements and mind. Yoga was developed by ancient Hindu saints, who used meditation as a way to stay in a strict sitting position all day. They used yoga with an aim to keep the body and mind fit for spiritual lifestyle and enlightenment. Yoga also helps in controlling the fickle mind, regulating the emotions and bringing flexibility to the body. It also helps in focusing on the goal of life. More than 90% of the patients have disorders arising due to mental stress and emotional suffering. That’s why experts recommend yoga to them because it will help them in overcoming mental stress and attain inherent peace. Yoga not only burns calories but also helps in regulating the mind. The body functions like excretion, digestion, and blood flow becomes regular and the thought flow is stabilized. Helps in giving control over the body and mind and minimizes the chances of diseases and disorders. It is easy to perform at home or garden or rooftop. The Differences between Yoga and Gym! The main difference between the two is the process by which they subject the body to attain the desired fitness. In the gym, the intense physical and mind agitation lead increase the heartbeat, blood flow and rate of respiration. They are excited intensely and then are allowed to settle down to normal gradually. Gym and other intense exercises are best to help the body overcome inertia and muscle sluggishness. The growth of muscle tissues is enabled and you can achieve the desired physical shape. The food intake and appetite is increased, so the body could build up. After the rigorous activity, you will experience a sound sleep, which will help in keeping the body fit. Yoga focuses more on regulating the entire body metabolism. It uses little physical strain with a concentration of different body parts with an enhanced mind that controls them. Through this, the mental concentration enhances and the thought process is kept under control. Research has proved that yoga is best for treating many psychological disorders, like – anxiety, depression, and stress. It helps in overcoming the addiction and the life span of a person is increased. Yoga controls the breathing rate and the metabolism is regulated through it. The processes like excretion and gut transit are improved by cleansing the body. Yoga versus gym is always an interesting inquest. And to answer such a question, the present requirement and physiology should be considered. For youngsters, sports men, actors – they are basically concerned with physical appearance and undergo extreme transformation to look good. Senior citizens, women after delivery, middles age and youngster, who want to reduce the mental stress, should opt for yoga. For people, with long sitting hours should opt for both, which will help in maintaining the body and mental health.